The patient noticed some hearing difficulties at the gland behind the ear on the right hand side. He was referred to hospital for a biopsy and blood testing. This didn’t show anything abnormal apart from high cholesterol and it was thought a possible to be an infection. He was given antibiotics and put on statins. Over the following 6 months when still complaining of the same thing he was given more antibiotics and re-tested, but still showing a clear test with no abnormal indications. Just an infection. After having more antibiotics and no reasonable recovery he returned and was finally diagnosed following a biopsy to the lower back, as well as facial gland. Liver nodules were discussed, as was also a tumour site at the lower spine. At this point within 6 weeks his condition worsened to the point where they diagnosed Salivary gland carcinoma and also that they were not able to treat him as it had progressed too far. He was referred to me in March 2018 by a friend of his who had successfully recovered, also from pathogenic virus. lifestyle. Together with a colleague who is a naturopathic nutritionist called Dani Benjamin a protocol was created and together this was implemented. I used ENS and to begin with I used Gold electrodes and changed shortly into the course to Copper electrodes. I changed back to gold later on in his course just for a change and he felt the difference. Presiding symptoms: He reported pressure and numbness in the right side of the face and also a lack of sensation with intermittent deafness to the right ear. To me the tumour site felt like his face was made of steel and it was very hot to the touch. Duration of first session: The first session of working on the body was approximately 27 minutes and made with Cosmodic working mode. The first dose position at T2 took around 15 minutes and didn’t complete the dose but went to 82%. The following 3 doses all took approximately a couple of minutes respectively. Whilst I was actually taking the first readings along 3 pathways he felt sensations to the left side of his bottom rib like a rapid vibration. His diet and lifestyle had been deemed to have been not complimentary and we had made suggestions with a totally new food plan and regime for him to follow. Courtesy of Dani Benjamin. New feelings reported in belly. Almost a tingle from belly to neck on left side (good side) from right side back up to shoulders and neck, pink colour. No photos were taken at this appointment, as I had not anticipated such dramatic changes. By this session, 4 days since the first session there had been a dramatic change in the size of the tumour of the face. Following the session this photo was taken. He had made significant changes to his nutrient intake that had been advised by DB. He had had sensations to the right side of his face and a drawing sensation from his jaw downwards. His sleep had improved. He was no longer needing to take the sleeping pills that had been prescribed. His energy was good. Once again the areas of priority although were more balanced they were all still focused at the same areas as at the last session, with addition to one position at the lower spine in an exact position opposite to the upper left side at T2/3. The session duration: 37.46 minutes. He reported a sensation from the left side of his shoulder to his toes and also tingly in the head. By now he had made one or two more changes to his nutrient base that had been suggested previously but not yet arrived. He was now juicing well and the day following the session he had increased amount of tingling in the site of the tumour. He had been called in for a second biopsy of the lower back as they were concerned about a secondary tumour but the results came through on this day that it had mysteriously disappeared! (This being the third biopsy taken at this site). His bowel movements had increased and was urinating more than before. He was now sleeping very well. Session duration: 32 minutes approximately. Much of the indications for where his body wanted me to work on this day were at the base of the spine and at the site of the biopsy site to lower back. Nothing at the top of the spine however the moment I touched him at the left-hand side lower spine he began to feel sensations at the face where the site of the tumour was. Modes: Using again modes ENS and Cosmodic with some Cosmodic VAR at the end of the session. 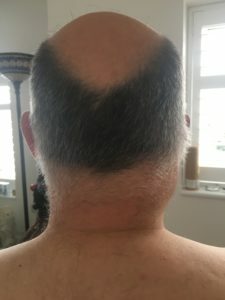 Work was administered to the lower spine and at the left-hand side he sensed tingling in the right side of his face (the side of the tumour) and a draining sensation from his right ear all down the neck area to his right shoulder. By the end of the session he had tingling at the front of his ear. He felt a little subdued. Having made even more dietary changes he was still feeling a little subdued. But his sleep was good and there had been sensations and tingling to his ear and the draining sensations again. My colleague made some further adjustments to his nutrient intake with some medicinal mushrooms and he had also found cannabis oil useful. He was due to be seen by the hospital again the following day at the oncology department. This was making him a little anxious. Modes used: Using ENS and Cosmodic modes. Average dosing time was approximately one and a half minutes each dose. I also used Cosmodic VAR at the end for massage. Slightly tight at the tumour area. To me it felt like there was a frame on his face and it was as solid as steel. At one of the doses half way through the session he had a sharp pain in the tumour site itself. But this was momentarily. The tightness had dissipated and there was a slight tingle behind the ear. Having seen the consultant again it was deemed necessary to give him a medication of a hormone to suppress the progesterone that a tumour can feed on. This was taken one dose later that evening, 3 the following day and now one on the day of this session. From the last session, which was Monday. He reported following my session that he had left feeling more upbeat (as usual). Tuesday he felt the same. Sleep was good. Wednesday he felt sluggish all day, but now today Thursday was fine again. Presiding symptoms: sensation in ear and the side of the tumour site a draining sensation. Work was today at C7 and also lower spine. The moment I touched the lower spine area he felt strong sensations in the jaw and face once again. Top of head tingled and behind the ear. Modes used: ENS, plus I changed to copper electrodes. Cosmodic VAR at end. Changes after: he felt relaxed, tightness at the top of one shoulder but the swelling had reduced substantially. He reported that the hearing in his ear that had been affected was begining to change and intermittently becoming improved. I took a decision at this juncture to not give him a break period anytime soon as given the additional medications that he had been given; my concern was to keep on top of the beneficial effects that he was feeling from each session. He arrived very subdued and left very upbeat. This appeared to be lasting until the following session each time. My fear was that his vital energy was becoming lost and depression could have taken hold and one of the positive factors with him had been his strength of purpose, manner and attitude. From here up to session 10 he stayed quite lethargic and downbeat. Improving after each session but not the vibrant man that had arrived on day 1. Each session I worked in ENS VAR to take readings and then ENS to give treatment with a little ens var at the end in massage. Using Copper electrodes and ENS device each time. Since changing to copper electrodes he felt less locally but more draining and certainly the tumour was shrinking at a speedier rate. 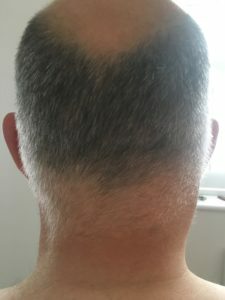 I was now working closer to the top of the spine and often at the left-hand side of his neck to mirror the tumour site. He was called in for a top up hormone injection. It was also evident and he was told, that from a recent scan there was a 90% improvement to the tumour and that the lower back was definitely clear now and reading as normal, although they couldn’t say why. This was also true to other areas that had been doubtful and pinpointed previously, now all showed as normal. He took the decision at this appointment to cancel any further injections and concentrate 100% on his holistic approach instead. For the 26th May 2018 I arranged for him to see another colleague of mine for a healing. At this session he fell asleep for an hour and when awoke thought it had been 10 minutes. But was in quite a daze. He took a further 20 minutes to recover before we allowed him to leave. Sessions 20 & 21 with me were more or less the same, nothing much here to report. Although his hearing was now more on than off, compared to previously where it had been mostly disturbed. Since the day with my colleague he has had 2 more sessions with me. At each appointment the same thing occurred. It appeared to knock him out and he had to rest a while, prior to leaving. Every 4 to 6 weeks also we had combined a further session with Dani Benjamin for amendments to his nutritional program. I will also mention that from time to time he would also update both Dani and myself with an update by text when the necessity rose. He had been totally in an altered space since having seen my colleague. He had also slept a lot more than usual. But with no adverse affects. The area that came up as priority for treating on this day was only at the site of the neck. I felt that this area appeared to now be healthy and was good, clear and touching the tumour was now as opposed to feeling like steel and high pressure, was soft and like a bath sponge in fact almost the same as the other normal side. So I elected to use ENS VAR at the neck around the area and opposite as well as around the chest and shoulders. He felt an immediate draining sensation as usual but very much more upbeat. He became very hot half way through the session he had a strong ANS parasympathetic response and became a little lightheaded. By the end he was once again knocked out and rested, before I allowed him to leave. 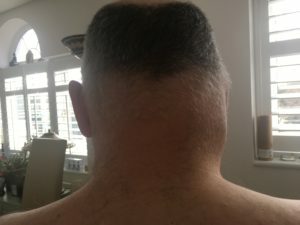 Said his right side of head felt weird. He arrived more upbeat to day. A bit more like his old self. He reported that each day the tumour had become notably smaller, so much so that he had taken photos each day. He had reduced his cannabis oil to a very small dose and had had some more sharp pain on and off in the tumour but that had now dissipated. Areas of priority today were as had been recently, to the top left-hand side of spine and also right side of face. Once again with confidence I followed what the body asked me for in ENS and ENS VAR. and I just feel in my opinion that the tumour is now dead. However, I shall continue for as long as it takes until the body is able to eliminate the dead tissue and pass it from the body.